In the small hours of the morning of June 3, 1914, a woman and her husband were found dead in a sparsely furnished apartment in Paris. Only when the identity of the couple was revealed in the English press a fortnight later did the full story emerge. The man, Henry Sackville-West, had shot himself minutes after the death of his wife; but Henry's suicidal despair had been driven equally by the failure of his claim to be the legitimate heir to Knole, one of the largest and stateliest houses in England. Henry's father, Lord Sackville, had been introduced to Pepita de Oliva, a beautiful Spanish dancer born in the backstreets of Malaga, in 1852. Their affair lasted until Pepita's death in 1871, and produced five children, of whom Henry was the youngest. One of his older sisters, Victoria, would eventually become mistress of Knole through a judicious marriage. But Henry and the other illegitimate members of the family, Max, Flora, and Amalia, were gradually eased from the historical record. The Disinherited rescues them from the shadows to which they had been consigned, revealing the secrets and lies that lay at the heart of an English dynasty. It is an absorbing and moving tale of sibling rivalry as the brothers and sisters struggle for their father's love and against the stain of illegitimacy that had condemned them to lives of poverty and disappointment. After studying history at Oxford University, Robert Sackville-West worked in publishing, founding Toucan Books in 1985, which creates illustrated nonfiction books for an international market. He now combines that with chairing Knole Estates, the property and investment company that runs the Sackville family’s interests at Knole. In 2008, he and his wife and three children moved into the house, which has been occupied by the Sackville family for four hundred years. 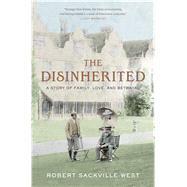 His history of Knole and the Sackville family, Inheritance, was published in 2010.